Hi friends! I am back with my second post here at The Love Nerds. I hope you enjoyed my Maple Bacon Stuffed French Toast from last month! After such a long winter, I am just itching for summer to get here. In anticipation of the warmer months ahead, I am already dreaming of the summer barbecues and get-togethers I will be attending/ hosting. A favorite activity of mine, during the summer, is a luau. Who doesn’t love a luau, right? 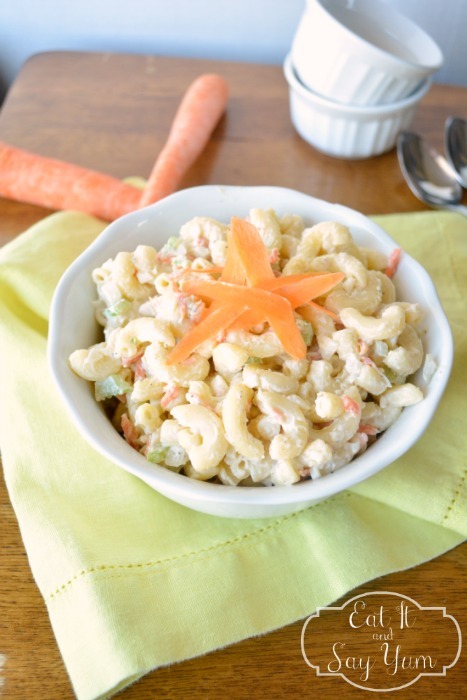 In addition to Kahlua Pork, and pineapple, a luau needs some good macaroni salad. 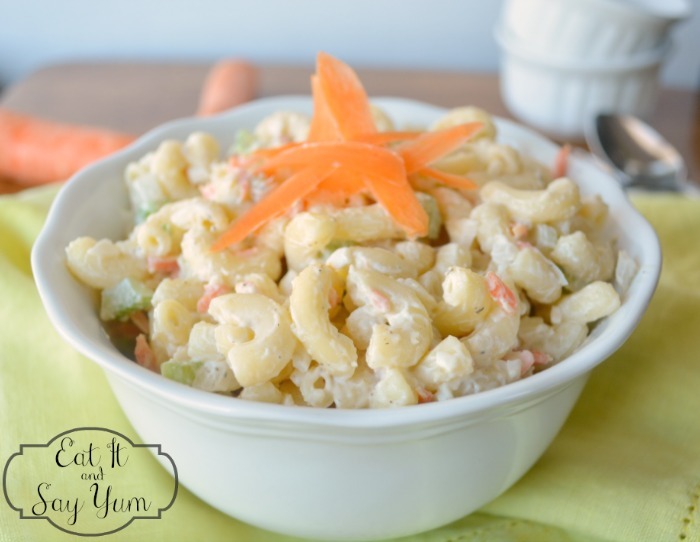 This cool, creamy salad is perfect for a luau, but it’s also great with any dinner like Maggie’s Southwestern Brat with Fried Pickles! The dressing is made with real mayonnaise (not miracle whip! ), vinegar, milk, sugar, salt, and pepper. 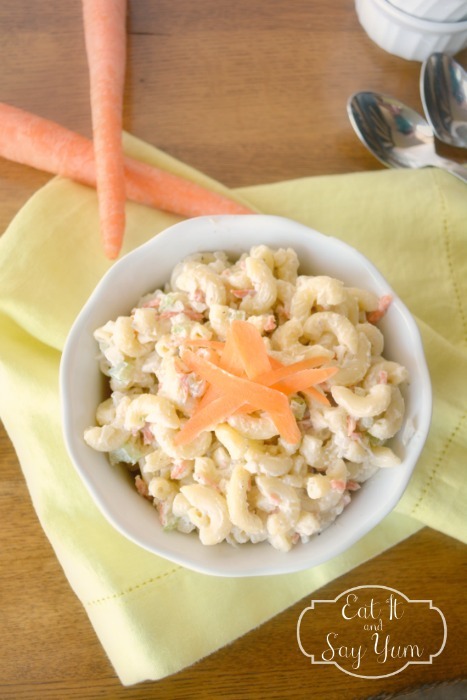 To give it some great texture and flavor, I added carrots, celery, onion, and some chopped hard-boiled-eggs. After the elbow macaroni is cooked and cooled you can mix the dressing together, then toss that in the bowl along with the veggies, eggs, and pasta. Super easy. Just chill until ready to serve. As the salad chills, the pasta will absorb the liquid. So right before serving it you may want to add a little more milk and salt. Just taste it, and see what you think. Again, it all depends on how long it sits in the fridge. Cook macaroni according to package directions (typically 6-8 minutes). Once cooked, immediately rinse the noodles with COLD water, until they are completely cooled. Set aside. While pasta is cooking, chop the celery, onion, eggs, and shred the carrots. Add these the a large mixing bowl, and set aside until the noodles are cooled. In a small mixing bowl, add the mayonnaise, sugar, salt, and pepper, milk, and vinegar. Stir with a fork or small whisk until smooth. 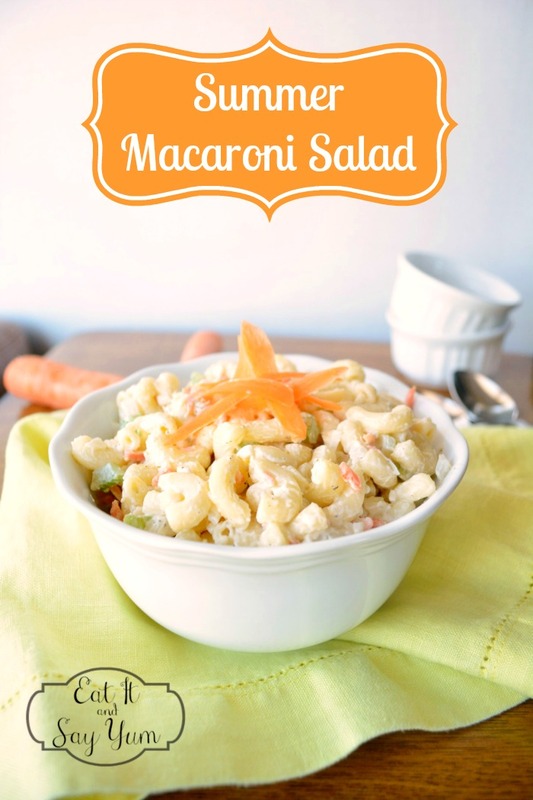 Pour the dressing over the veggies, eggs, and macaroni in the large mixing bowl. Gently stir, to evenly coat everything. Place salad in fridge until ready to serve. If the salad sits for more than an hour you may want to add additional milk and salt to enhance the flavors and texture again. The pasta will have absorbed a lot of the liquid and salt. So, are you ready for summer now?! I can hear some tropical islands (or the local pool) calling my name already. And my taste buds are dying for some good barbecue dinners! Remember to visit me at Eat It & Say Yum! I will be sharing lots more summer recipes there. Just made to bring over to a bbq and it is delicious! Love the shredded carrots (I shredded 3 carrots). Thanks for the recipe! This looks so delicious! I am going to pin this to make later for my family!